Register Now! 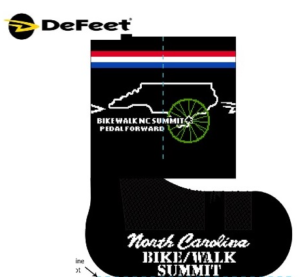 Just a few Bike/Walk Summit custom socks left so register now to secure a pair. Also, the hotel rates (some at major hotel chains <$70/night within 10 min of downtown) must be booked by the end of September (in ~ 2 weeks!). We look forward to hearing from new leadership at NCDOT – Deputy Secretary Julie White – as well as new perspectives from AARP on age-friendly communities, livability and of course Complete Streets. The Wilmington Summit Planning Committee has been hard at work developing walking and bicycling mobile tours of downtown Wilmington and the UNC-Wilmington campus environs. You can do these on your own or guided at selected times. Transportation Professionals (open to all!) – please consider taking the Bicycling Traffic Skills Class on Nov 2nd. Visit http://www.bikewalknc.org/nc-bicycle-summit/ for lodging information (toward the bottom) and to learn more.